Where Earth got its oceans is a big question, and the currently preferred explanation is that ancient comets brought in huge amounts of water from the outer solar system. That hypothesis just received some big evidence to back it up. The current model holds that Earth's oceans began to form about eight million years after the rest of the planet - not a lot of time on a geological scale, but enough to suggest that a distinct process was involved. Scientists hypothesize an off-world source for all that water, and ancient asteroids have generally been the focus of these investigations. 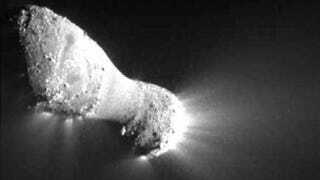 But scientists have also considered comets as a possible other source for Earth's oceans. Now, researchers at the University of Michigan have found some striking evidence to back up that idea. Analysis of the comet Hartley 2 by the Herschel Space Observatory has revealed that the water frozen inside the comet has precisely the same chemical composition as the water on Earth. Specifically, it has the same ratio of hydrogen and deuterium - a hydrogen isotope with a neutron in it - as the water found in our oceans. We've never found ocean-like water in a comet before, and the scientists speculate that this particular comet originated in a different place than most other comets we see. This one, they suggest, came from the Kuiper Belt, the band of material just beyond Neptune in which Pluto is found, while most other comets come from the far more distant sphere of rocks and debris known as the Oort Cloud. That may mean that a lot more comets formed in the Kuiper Belt in the solar system's early days, and these are the ones that carried a significant chunk of our current water supply to Earth. Via Nature. Image of Hartley Comet via NASA.